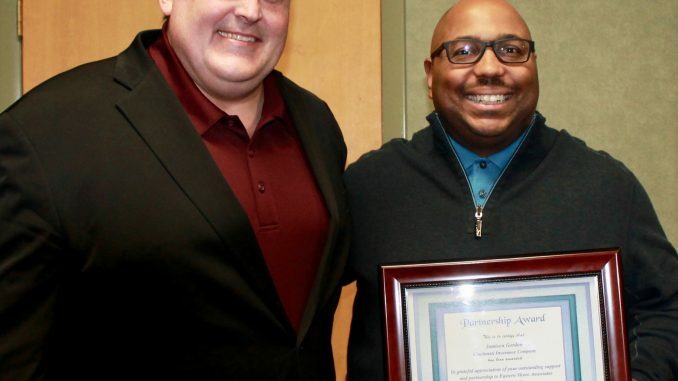 FULTON – Eastern Shore Associates Insurance, a Trusted Choice agency, has awarded its annual Commercial Lines Partnership Award to Jamison Gordon, field director-sales and marketing, for The Cincinnati Insurance Companies, Cicero. 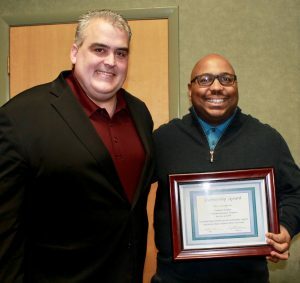 Eastern Shore Associates Insurance awarded its annual Commercial Lines Partnership Award to Jamison Gordon, (right). At left is Eryl Christiansen, ESA president. Gordon was nominated for this award by the ESA commercial lines employees with whom he works. Headquartered in Fulton, Eastern Shore Associates is a Trusted Choice agency and ESOP (employee stock owned) company. ESA offers a full range of business and personal insurance, including property, liability, automobile, boat, farm, recreational vehicle, workers compensation, and bonds. In addition, they offer financial planning and risk management services. Other services include commercial risk analysis, loss control, and employee benefits. They also meet the insurance needs of many New York municipalities, schools, and emergency services.